The development process for Space Quest 5, began in December 1991 when Director Mark Crowe and Assistant Director David Selle sat down and began roughing out the story line for The Next Mutation. It took them about a month of conceptual work to come up with the preliminary design and story for Space Quest 5. The next phase of development was to firm up the story line, flesh out the design and draw the storyboards for the project. Technical issues and feasibility of designer ideas were evaluated and revised with input from both the programming and art teams. For Space Quest 5, this process stretched out over a two month period, during which time Art Director Shawn Sharp penciled over 200 sketches for the storyboards. With the storyboards under development, backgrounds for the game were being roughed out. Nearly one hundred backgrounds and close-ups were called for in The Next Mutation. Background painter Rhonda Conley was the in-house specialist responsible for painting the many backgrounds sketched out by hard-working Shawn Sharp. After the storyboards were drawn up and the backgrounds specified, the animation sequences were planned and a preliminary art schedule worked out. An extensive list was drawn up for SQ5 detailing the more than 1100 loops of animation that would be called for in the finished game. Lead Production Artist Mike Jahnke headed up the team of artists that undertook this formidable task. After the static backgrounds were painted, they were digitized and scanned into the computer. The animation sequences were brought into the game in two ways: some loops were hand-painted, while others were digitized in a video capture process using live actors and a 3-chip video camera. Production artists Jarrett Jester, Kerrie Abbott, Ron Clayborn and Sean Murphy took these raw images and shaped them into the animation loops and backgrounds that were incorporated into the final game. About four months into the project, the final production schedule was arrived at and the programming team fired up, led by David Sandgathe. As the artists finished artwork, the programming team went to work combining the disparate elements of the game into a cohesive whole. Programmers Geoff Rosser, Hugh Diedrichs, Joe Nelson and Nancy Hamilton faced the daunting task of bringing together art, music and story elements within the framework of the overall game design. Space Quest 5 was programmed using a proprietary scripting language called SCI (short for Sierra Creative Interpreter). Early in the production process for the game, a sound and music specification was drawn up by the design team and given to composers Chris Stevens and Tim Clarke. Together, they sweated over every grunt, gasp and groan that went into the final game soundtrack. Meanwhile, Assistant Director David Selle shouldered the burden of writing the myriad of text and dialogue needed for The Next Mutation. 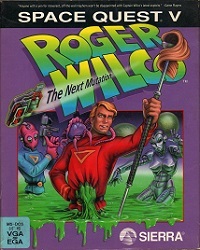 After programming was completed, the game faced a four-month quality assurance process led by Forrest Walker and Gregg Giles to ensure that no bugs or glitches remained in the shipped version of the game. Finally, 14 months after the preliminary design meetings were held, SQ5 was shipped to eager Space Quest fans across the galaxy. But the story doesn't end there. The Next Mutation will be translated into five languages and converted to a full-voice CD-ROM version as well. Whew!